Elaine Hancock (Olney, United States) on 22 March 2018 in Animal & Insect. The snow has been very pretty. The first really measurable snow we have had in 2 years. Lovely image...beautifully set off by the white snow.. The grill has created a beautiful design here in the snow !!! A great contrast between bird and snow. He seems to be enjoying the snowfall. Un très très bel oiseau que je ne rencontre pas chez moi. Le neige est là, et c'est joli sur cette photo. @Pascale MD: Ce cardinal est commun dans la partie sud-est des États-Unis. Le rouge vif du mâle est toujours si joli. Wow, super combination ! amazing capture !!! Stunning clarity and color captured in this cardinal!! It brings out great textures in the snow as well. THIS IS composed perfectly. The red really pops surrounded by the white snow! oh, my, it's so brave ! A great pictureo of this cardinal. Impressive contrast. A beautiful image of this ref fellow against the pure white snow. En général la neige ne fait pas trop de dégats sur ce plantes c'est surtout le gel du matin qui est dangereux. The ideal place for this handsome red bird - surrounded by white! Beautiful. 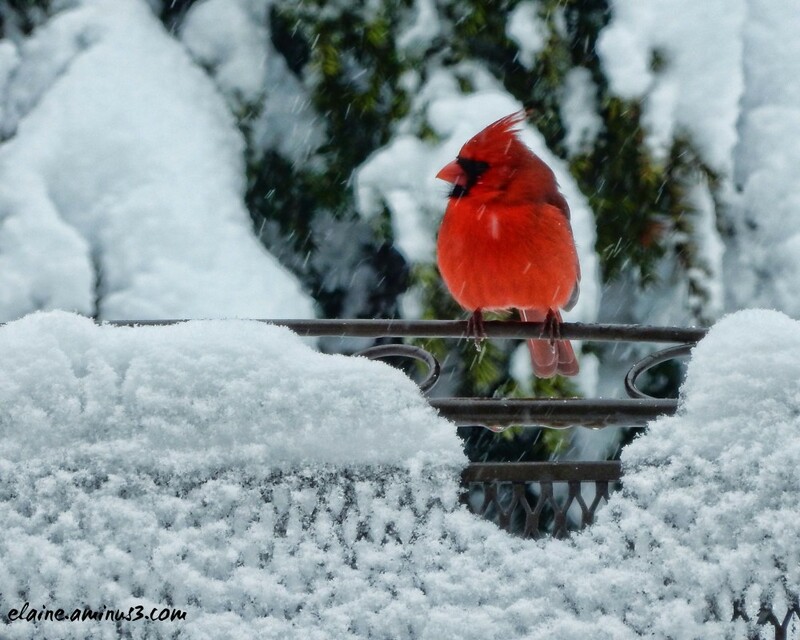 I love cardinals and especially in the snow. I'm sorry to say we've had no measurable snow this year. This is gorgeous....our former home in Easton, PA is getting Hammered with snow...How are you doing there? @Denny Jump: We got about 5 inches of heavy wet snow. It was beautiful to watch. The snow made the Cardinals stand out.